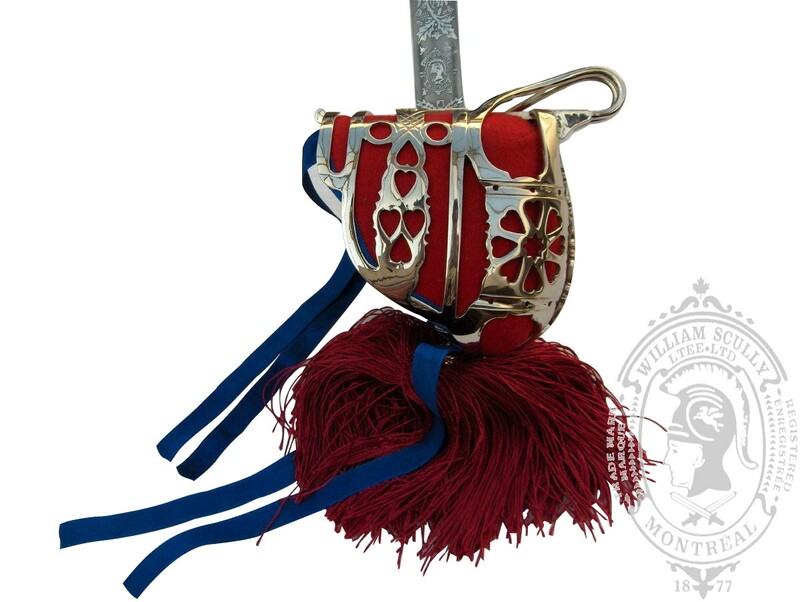 Traditional Scottish basket hilt of bright nickel-plate steel with fluted, conical pommel. Sharkskin grip. Basket lined with white buckskin covered with scarlet superfine. Red silk "wig" fringe. The 82 cm. hand-forged, tempered steel blade is double edged with a single, central fuller and is etched with thistle scrollwork plus the Royal Crown and Cypher on the right side of the blade and the Canadian Shield-of-Arms on the left. The scabbard is bright nickel-plate steel with double rings and proper ball tip. Includes metal scabbard and cloth carrying case. Does this meet your requirement? We manufacture to Government spec., and this expertise will meet your custom requirement. Request For Quotation - sales@williamscully.ca or 1 (514) 527-9333. Minimum order quantities may apply. Availability: Usually ships in 1 week.